Falmouth Jewish Congregation invites the public to a free, public screening of the film Shoelaces on Tuesday, February 14 at 2:00 P.M. This 2018 award-winning Israeli feature film is offered to mark February’s designation as Jewish Disability Awareness, Acceptance and Inclusion Month. This engaging, tender family dramedy won the Audience Choice Award for best feature film at the Los Angeles Israel Film Festival and was nominated for eight Israeli Academy Awards, including Best Picture. Discussion follows the screening and refreshments will be served. All are welcome to this event, held at the congregation’s Blanche and Joel D. Seifer Community Center at 7 Hatchville Road in East Falmouth. Shoelaces (Israel, 90 mins. 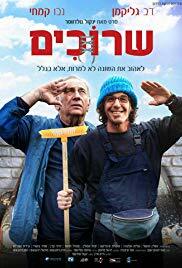 in Hebrew), directed by Jacob Goldwasser, is the story of the complicated relationship between an aging, irascible father (Reuven) and his exuberant special-needs adult son (Gadi), whom he long ago abandoned to be raised by his mother. With his ex-wife’s untimely demise, Reuven (Doval’e Glickman (who plays the patriarch Shulem in the popular Israeli series Shtisel on Netflix), in an Israeli Academy Award-winning role for best supporting actor) is suddenly thrust into the position of caring for his now-grown son, whom he first considers placing in a group home. The transition is fraught with difficulty for both, as Reuven wrestles with the obligations of parenting a child with disabilities, while thirty-something Gadi (Nevo Kimchi) grieves the loss of the mother who nurtured and shielded him. Adjusting to their new circumstances, Gadi lends a hand in his father’s Jerusalem auto repair shop and befriends the locals at a neighborhood café. Reuven vows to atone for past shortcomings, over time warming to Gadi’s boundless optimism, infectious laugh and seemingly infinite capacity for love. Their co-dependent bond will be tested by tribulations that prompt complicated ethical and legal questions with profound ramifications. Falmouth Jewish Congregation, an inclusive, egalitarian Reform congregation serving the Upper Cape and beyond, is located at 7 Hatchville Road, East Falmouth and is accessible and welcoming to all. For further information, please visit the website at www.falmouthjewish.org, visit our Facebook page, or call 508-540-0602.